I'm addicted...I'm obsessed...I'm just crazy...for savory bread pudding. This recipe is adapted from Gourmet magazine - generally replacing a lot of the fat with more herbs and skim milk instead of whole milk and heavy cream. 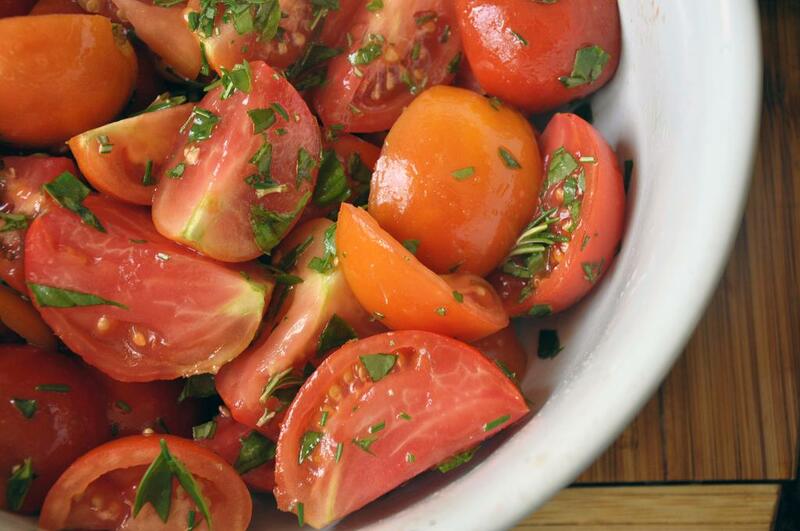 Toss tomatoes with herbs, 1 Tbsp EVOO, 1/2 tsp SnP each. 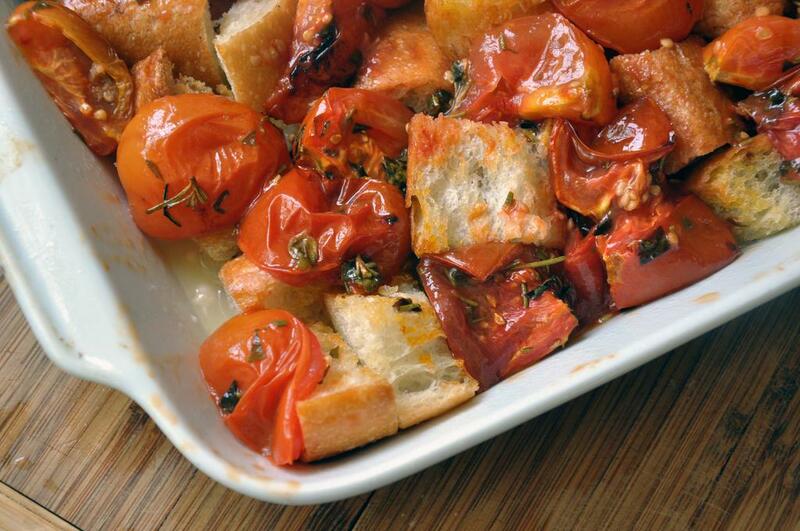 Arrange tomatoes, cut side up, in a casserole pan or line a sheet pan with foil and spray with cooking spray. Cut off the top of the garlic head, about 1/4" down. Put on small sheet of foil and drizzle with about 1 tsp of EVOO and 1/4 tsp SnP each. 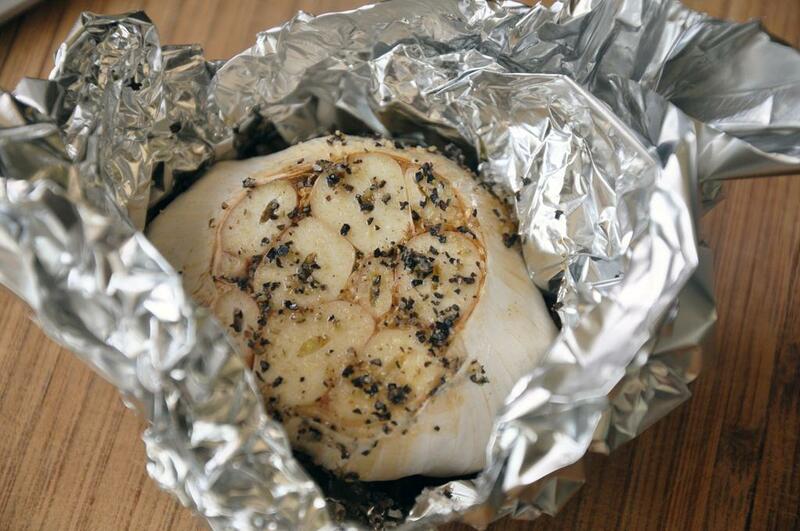 Wrap foil around garlic so none is exposed. Put foil-wrapped garlic on pan with tomatoes and roast both together in oven for 50 minutes. Meanwhile, toss bread cubes with last Tbsp of EVOO until coated. Spread out on foil-lined baking sheet sprayed with cooking spray. Bake in oven with tomatoes and garlic for the last 10 minutes. Remove everything from oven and let cool. Turn heat down to 350. Meanwhile, whisk milk, eggs, 1 tsp SnP each. Add grated cheese. 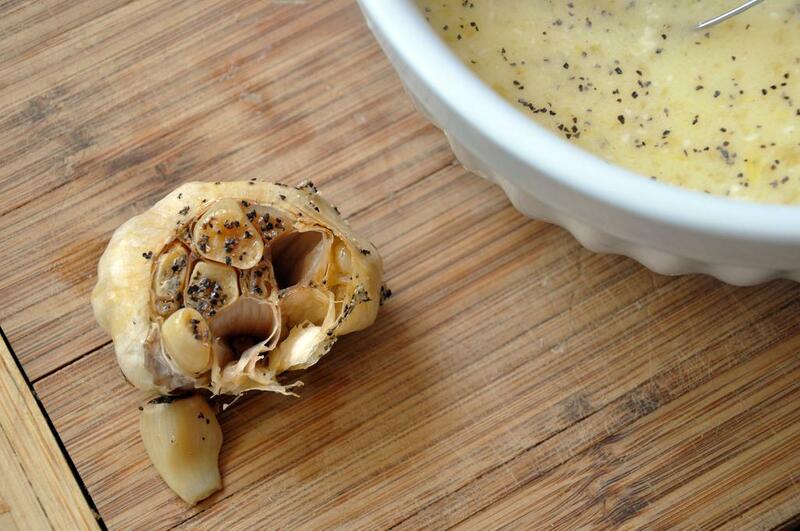 When garlic head is cooled, squeeze out all the cloves into the milk mixture. They will be soft and slide out easily. Transfer milk mixture to cooking-spray-coated 13x9 casserole dish. casserole dish. 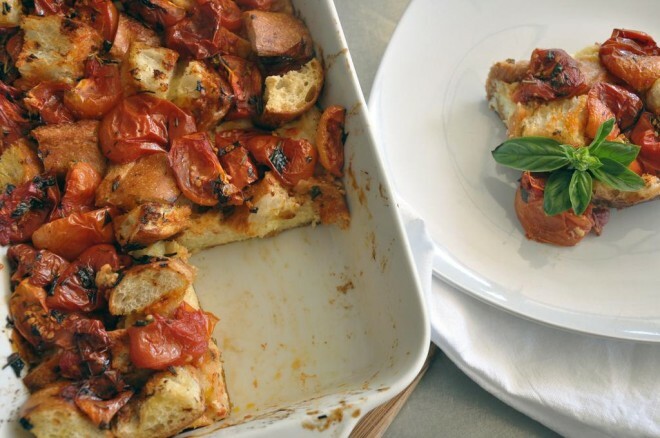 Add bread cubes and tomatoes and spread out evenly without breaking them up. Make sure to push bread and tomatoes down into milk mixture so they absorb liquid and will set together when cooked. Bake at 350 until firm and golden brown, about 50 minutes. Adrienne–what is “EVOO”? I was absent that day! I’m a huge fan of bread pudding. I love the idea of a tomato pudding, too! Great recipe, the presentation is delicious. We’d like to invite you to participate in our September apple and peach recipe contest (the recipe can be sweet or savory). All competitors will be eligible to win one of three prizes :)! Please email me, sophiekiblogger@gmail.com, if you’re interested.